With the rising cost of food, everyone is looking for alternative ways to save money on healthy foods. One of my favorite things to do is home canning. Get started to learn How to can, what equipment you need, and a big list of common canning resources! 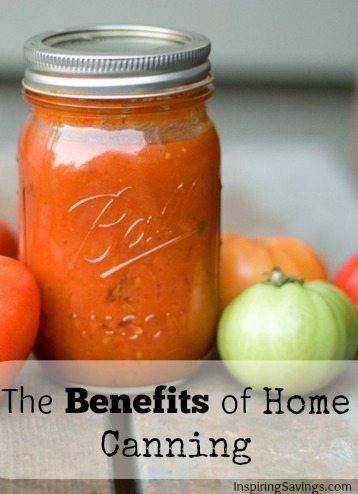 See the benefits of home food Canning and Preserving. With the rising cost of food, everyone is looking for alternative ways to save money on healthy foods. One of my favorite things to do is home food canning. At first, canning requires a lot of upfront costs (if buying everything new), but in the end, it saves you and your family money. Plus, these items will last you a lifetime. I admit that canning is more of a hobby for me. Over this past summer, I purchase over 15 lbs of tomatoes from a local organic farmer for just $4 (they were starting to turn). That turned into 17-pint size jars of homemade spaghetti sauce. With the extra ingredients (onion, garlic & spices already on hand), I figure each jar filled cost me roughly $0.30 each, plus my time to make. Sometimes I wonder if I was born in the wrong era. Canning is really one step beyond cooking. It is a method that applies heating food in a closed glass home canning jars to stop the natural spoilage that would otherwise take place and removes air from the jar to create a seal. I am not going to be able to go over the types of canning methods, but rather all the benefits. I will provide some great resources on Home Food Canning at the end of this article. What Are The Benefits to Home Food Canning? Food can be expensive. Buying or picking foods in season and canning them for future use can save you some extra money. This is especially true when you consider the quality of the foods you are getting. You may be surprised how gourmet your home canned food can taste. Home food canning allows you to put exactly what you want in the can. Home canned fruits and vegetables are free of preservatives, colorings, high fructose corn syrup, and added flavorings. You control everything that goes into it. 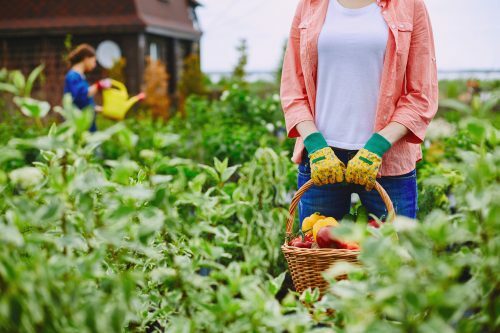 You have the advantage of choosing organic produce, the amount of sugar you use and the overall flavor of the food. This might seem silly, but when I see all my jars lined up in my basement pantry I feel a sense of pride and accomplishment. I suppose it is similar to the olden days when a father would hunt for the meat that would feed his family. I feel that all of those jars are my contribution to feed my family. All of my efforts are from growing my own veggies and canning them. It is an excellent feeling. It’s a fact, homemade food simply tastes better. You can’t beat a quality home-canned product made from fresh, locally grown ingredients. In the store, you could easily pay double for such a product. Another added benefit to home food canning is that you will be able to tweak recipes to your exact tastes and even experiment with new flavor combinations. Not sure where to find great tasting recipes? You need to turn to the “Bible” of all canning books. Please take the time to purchase The Ball Complete Book of Home Preserving. This is the holy grail to canning. I don’t know where I would be without it. I refer to this book often. It comes with canning instructions and many many recipes. The canning process is quite simple, but starting without the proper knowledge or equipment can lead to producing toxic food. Seriously! It is true. Perhaps the biggest disadvantage of canning food is the potential for contamination. This is why it is so important to follow all the steps to the canning process. Let’s stop the whole process in its tracks by getting you prepped. All these resources are through The Domestic Wildflower Website and can be purchased for a small fee. These resources are very valuable to those wanting to get involved with home food canning. Canning Essentials Workbook – Plan, prepare and preserve your food. With this easy to follow workbook. It gives you plenty of space for notes as well. Canning Basic Course – This will give you all the details you need to get started with canning and why you should be canning for your family. Canning for Beginners Ebook Bundle – A collection of ebooks to get you started preserving delicious, homemade food in jars today! Many people think that you only can food through one season, but let me assure you—canning is a year-round money-saver. It is easier than you think and well worth the investment.